Looking for the perfect sofa? Just team the TERENCE Light Grey Modular Corner Sofa with the other elements from the range to create a made-to-measure sofa. With its straight, elegant lines, this contemporary corner sofa will adapt to suit your style and space. 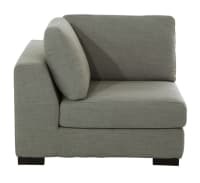 We love its generous curves and soft cushions which give it a super cosy vibe!